Similar to any other web browser, Safari also records your browsing and search history for easier access later. This stock iOS browser stores all the data such as logins, cookies, caches, website data, etc. unless you clear/erase it. 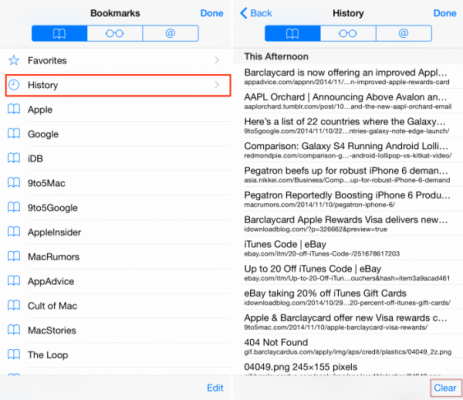 Clearing the Safari history from iPhone is quite easy and it can be achieved via a number of methods. 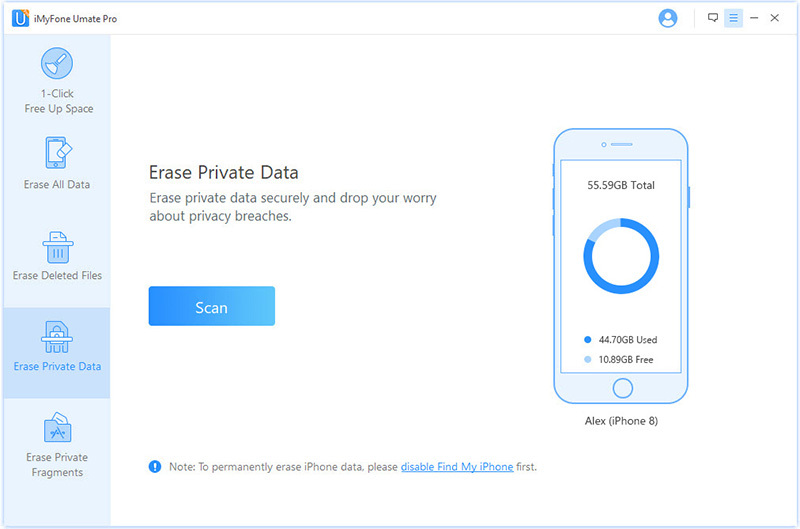 In order to erase iPhone Safari history permanently for your iPhone, you will need to use a good third-party iPhone data eraser tool. 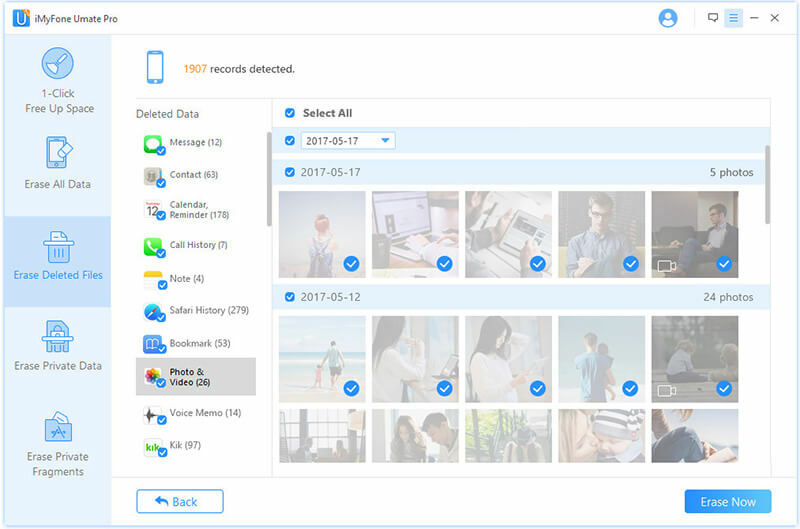 iMyFone Umate Pro is a recommended choice in this regard because it is fast, efficient, and a one-stop solution to all your iPhone data erasing needs. Permanent data deletion is guaranteed with Umate Pro. Erase Safari history, website data, cookies, cache permanently and make them 100% unrecoverable. If you have already cleared Safari history the ordinary way, then you can easily find it via Umate Pro and erase it permanently. Umate Pro allows you to preview files before deleting them permanently. You will be able to preview them even if they are already deleted. Erase your private data permanently including safari history, safari caches, safari cookies, call history, messages, photos, videos, etc. 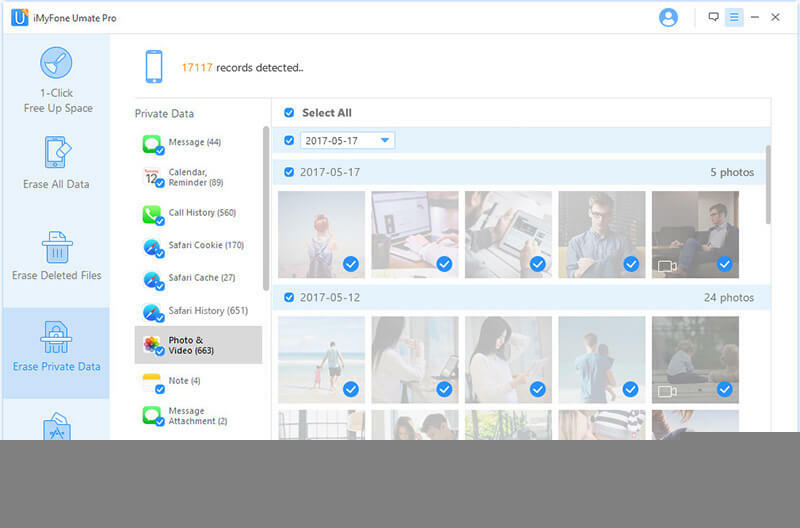 Use 1-Click Free Up Space feature to clean junk files, erase data fragments of third-party apps, etc. to free up your iPhone’s storage and make it run faster. Step 1: Connect your iPhone via lightning or USB cable to your computer and launch iMyFone Umate Pro. Step 2: Select Erase Private Data tab on the software and click Scan. You will be shown a list of private data files available on your iPhone after scanning. Step 3: Preview and select Safari Cookie, Safari Cache, Safari History on the list according to your needs and then click Erase Now. There are multiple ordinary ways to clear Safari history. Each one allows you to clear any or all history of the Safari browser according to your preferences. Step 2. Find and tap Safari. Step 3. Now in the Safari section, select Clear History and Website Data option. Step 4. Then tap on Clear History and Data when prompted to confirm your action. It will remove safari history, cookies, and other browsing data. Step 1. Launch Settings app on your iPhone and navigate to Safari > Advanced. Step 2. Once there, find and tap on Website data option. Step 3. Here you have two options; either clear all your website data or clear it selectively. To clear all of it, select the Remove All Website Data option. It will clear data that could be used for tracking. And if you want to clear the website data selectively, then simply swipe left and right and choose what you wish to delete. You will need to tap on Delete button to get rid of that specific data you have selected. Step 1. 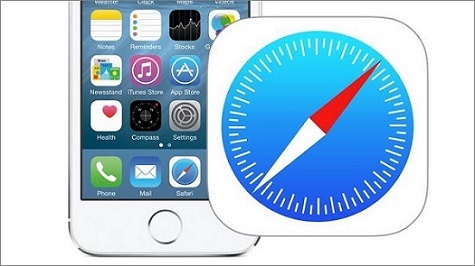 Launch Safari browser on your iPhone. Step 2. Select the bookmark icon shown at the bottom. Step 3. Now select bookmark tab and then tap on History. Step 4. Once the History page is opened, tap on Clear button located at the bottom right corner of the page. Now you can clear your history and website data of various time frames including The last hour, Today, as well as All time. 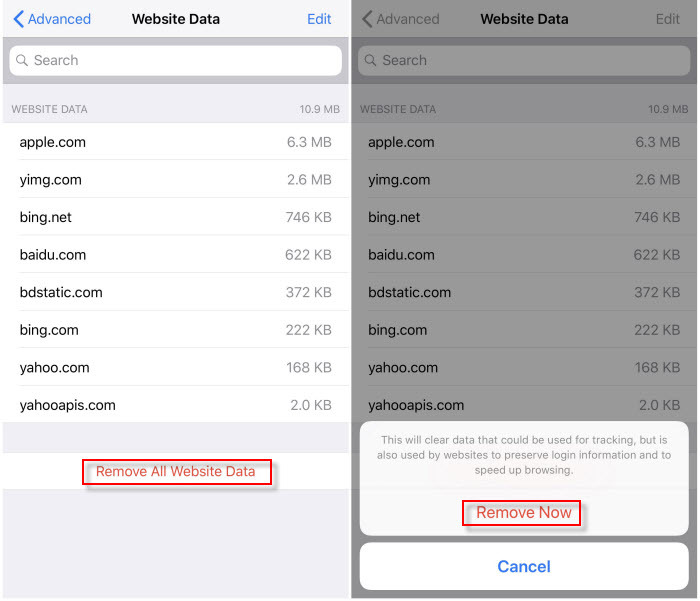 The major downside of clearing Safari history the ordinary way is that the data is not permanently erased, which means it can be easily found/recovered by a third-party app/software. 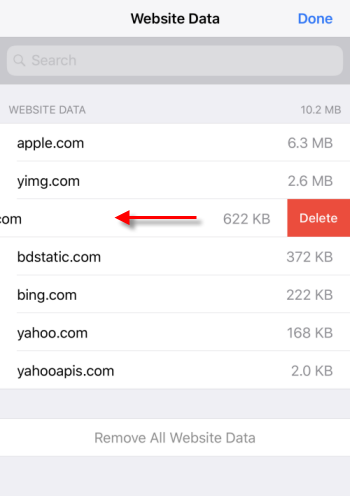 With this methods, you will be able to permanently erase the safari history that deleted by the ordinary ways. Step 1. Launch Umate Pro on your Mac/Windows PC and also connect your iPhone with it via lightning cable. Step 2. Choose Erase Deleted Files from the tabs shown on the left side bar of Umate Pro and click the Scan button. Step 3. A list of your deleted files will be displayed once the scan is finished. Select Safari History from the provided list and click Erase Now button.